Signs - Purplish-black usually rounded blotches appear on leaves, which then start to yellow and fall early. Stems may be affected in severe cases. Damage - Badly affected plants may die as they are so seriously weakened they cannot withstand the winter frosts. It is very unsightly. Treatment - A bacterial disease so one of the best ways of dealing with it is by good hygiene. This is particularly true for black spot as it over winters on fallen leaves and stem lesions. Remove all dead leaves in autumn to prevent the spores from over wintering, burn the leaves or take them to the skip rather than use them for compost or you may well just perpetuate the problem. Prune out any damaged branches in the spring. 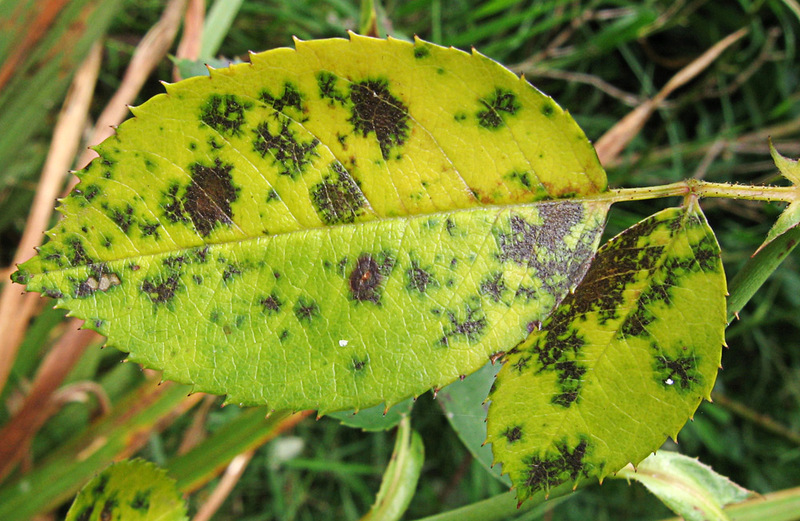 Black spot particularly attacks roses and it is important to keep them as healthy as possible so they can withstand attacks. Mulch with a good thick layer of well rotted farmyard manure around the base of the plants in the autumn and spring. It is also worth searching out roses that show resistance to black spot. Elder spray. This kills aphids, small caterpillars and is useful as a fungicide for mildew and blackspot on roses. The toxic agent is hydro-cyanic acid, so in preparing the spray use an old saucepan. Q. We have a strawberry tree (arbutus unedo) which we planted about 7 years ago. The tree has grown to about 18 feet, with abundant healthy foliage on the new growth. However, the leaves seem to rapidly develop black spots and die back, leaving only the most recent growth healthy and intact. Any regrowth that occurs along the stem also seems to rapidly suffer the same fate. The supplier of the plant says that only the outermost layer of leaves will remain in a normal specimen, but I think that the tree is not entirely healthy, as indicated by the blackening of the leaves. Any ideas what we can do? The tree is in a sunny position, on slightly acid, clay soils. The site is not waterlogged, as the tree is at the top of a bank, adjacent to a pond. A. I'd agree with you. Strawberry trees are susceptible to "leaf spot" and it sounds quite clearly that some infectious agent is responsible for what is happening. I know of no case where plants lose leaves in the manner that you describe by any normal means of dropping mature leaves. I'd guess that the cause is bacterial similar to what happens to roses with "black spot". The cure is not easy to administer and the disease is quite resilient. The bacteria are usually spread by water-borne rain-splash or insects. Not watering will help if this is a contributory cause. Remove all affected leaves and spray with Bordeaux mixture, remove fallen diseased leaves from beneath the tree and dispose of by burning or other means, but NOT on the compost heap. You may need to repeat this treatment several times to eradiate the disease. The other alternative is that the spots are fungal in origin, in this case the spots appear to be concentric circles, close inspection may show pin-prick sized fruiting bodies. The treatment is the same but spray with benomyl or a copper-based fungicide. Feedback - I didn't have enough Bordeaux mixture to treat the tree when I looked in the shed, so I used a modern systemic treatment that targets black spot. I used it at a fairly high concentrations & drenched the entire tree, including all the lower branches that had no leaves.. Within three or four days a large number of 'budlets' have formed, even in those areas which looked dead. So, I am going to repeat the treatment every two weeks, which is the maximum rate that they recommend, although I might reduce the concentration from now on. I had almost given up hope, it looks like there may be a chance, yet ( our gardener was full of doom about the prognosis! ). Thanks for the help.... will keep you informed on progress.